My relationship with eyeliner has been, let’s say, interesting. When I first started dabbling in makeup, it was the only product I wore. Yeah, seriously. No mascara, just eyeliner, and with naturally smaller eyes, it wasn’t doing me any favours. Over the years, I learned a thing or two, and I think I wore eyeliner every day until the end of my University career. Now I save it for special occasions. If you wear eyeliner, you know that the trouble comes when they don’t stay put. If you’re on the hunt for the best eyeliner for your waterline, read on. When I started wearing eyeliner properly- you know, with mascara, and without layering it on like Avril Lavigne circa 2002, it became one of my best makeup allies. I would wear it subtly on the daily, but noticed that the pencil liners I was using just weren’t doing the trick. They would always wear off my waterline by the end of the day. 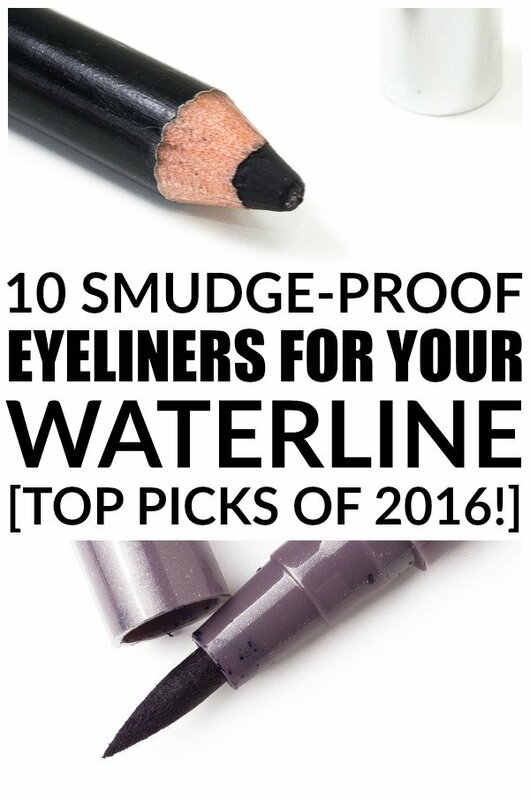 But it’s called the waterline for a reason, so it makes sense that to stay, you need to find an eyeliner that is waterproof and smudge-free. Recently I’ve been going sans eyeliner during the day, but a swipe of liquid eyeliner along the waterline at night can really take your look up a notch. It’s smokey, dramatic, and can take you from gorgeous to drop dead gorgeous in a few easy glides. Liners formulated with rich pigments that are waterproof, smudge-proof and long-lasting are key to a look that will last all day and night. Whether you prefer a pencil liner, an applicator, or a gel you can brush on, I’ve rounded up 10 of the best eyeliners for your waterline. They won’t run, they won’t smudge, and you can customize the thickness of your eyeliner to your preference with every one! The creamy gel-like formula of Ingot’s eyeliner is delicate and it lasts all day. It has high-intensity pigments, but is hypoallergenic and smudge-proof, meaning you don’t even have to think about dreadful racoon eyes. It’s totally waterproof, so you don’t have to worry about it not staying put on your waterline, plus it has raving reviews on Amazon. Just see for yourself! Available in both brown and black, this waterproof eyeliner is crease-resistant and dries in 60 seconds with smudge-proof results! Perfect for a smokey, yet natural look that will last all night, you’ll keep coming back for this one. This may be marketed as an eye shadow, but it works perfectly as an eyeliner that will stay put on your waterline. It has a long-lasting formula, with a creamy texture and rich black pigment. Simply use a small precision makeup brush, dash it along your waterline, and you’ll be good to go! First of all, the packaging of this eyeliner is divine, and the hand-held liner makes for easy application. It’s cruelty and paraben free, plus it dries as quickly as 3 seconds after you put it on. It lasts 24/7 so it’s perfect if you have a long flight or are partying into the night. The high precision flexible brush tip allows you to apply a line of any thickness, and it won’t smudge with water, perspiration, or tears. If you’re a simple eye pencil gal (like me!) Butter London’s wink eye pencil is right up your alley. The waterproof formula goes on smooth and precise, for a look that will blow your friends (or date) away! It’s long-lasting with just the right level of intensity, and you’ll never have to worry about it smudging. Available in a range of hues, you can go natural or add a pop of colour to your look! This magical liquid eyeliner won’t smudge, feather, or run, meaning you can apply it and it will last all day and night! It’s equipped with an easy-glide, quick-dry precision applicator that makes it simple to swipe on as you’re running out the door in the morning. Glide it on thin and fine or dramatic and thick for a night out. Anything goes! Another one for the pencil lovers, this liner will stay with you through the hustle and bustle of your long days. Formulated with 50% moisturizing ingredients, it won’t dry out, yet is still waterproof. Application is soft and creamy, yet it boasts colour, for a vibrant look that won’t budge! With an automatic pencil that twists up, you don’t have to worry about sharpening this eyeliner. Clinique is one of my favourite makeup brands, and this liner does not disappoint. The silky formula allows you to apply it with ease, and if you’re into a smokey, smudged look, it comes equipped with a smudge tool on the opposite end. Use it on your waterline or create the perfect cat eye. Everyone needs a Chanel liner for fancy nights out drinking bubbly and dressed to the nines. And if there’s going to be dancing, don’t sweat it. Literally. This liner resists water, humidity and sebum so it won’t run and you can dance the night away without worry. It’s gentle, comfortable, and goes on seamlessly. A must for your makeup bag. Because not all of us can go all out with Chanel, this Revlon liquid liner will do just fine. It’s long-lasting, so it won’t smudge or fade, and the easy applicator allows you to draw on any size line you want from thin to thick. It glides on smoothly and will last all day at the office, or out to drinks with friends. Finding eyeliner that works with your waterline isn’t an impossible feat. These 10 liners are sure to have you looking beautiful, without any smudge or run! If you found this collection of eyeliners for your waterline awesome, please share it on Pinterest! And if you’re looking for more beauty-related tips and tricks to keep you looking your best year-round, please follow our Beauty board where we share all kinds of great ideas!